Our region offers endless opportunities for autumn escapes. Here are a few ideas for a weekend getaway. Historic charm and fall foliage are drawing visitors to Dubuque, Iowa, this autumn. This Mississippi River town is one bridge away from both Illinois and Wisconsin and their stunning vistas. In addition to these lofty views, visitors enjoy exploring the National Mississippi River Museum & Aquarium, at the Port of Dubuque. 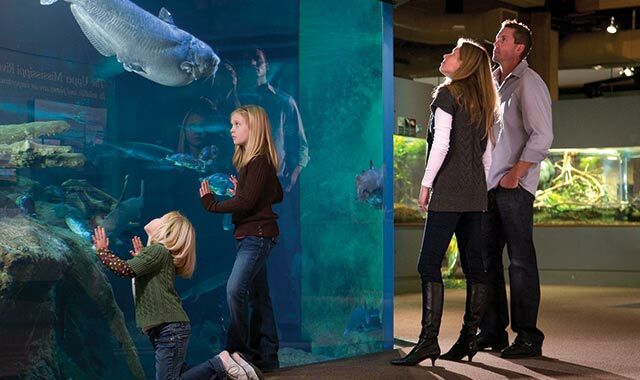 The museum is home to interactive displays, a 3-D/4-D theater and a wide collection of native river wildlife. Guided tours are available. Locals and travelers alike look forward to the Dubuque Food and Wine Festival, happening this year from Nov. 6-8 at various locations throughout the city. Not only will attendees experience the culinary creations of local establishments, but they’ll also enjoy live music and in-depth insight from gourmet food experts. Festivalgoers can opt to purchase a weekend package that includes overnight accommodations at Hotel Julien Dubuque, one of the area’s most elegant lodgings. The century-old boutique hotel marries modern amenities with the historic charm of the Old Main District. No visit is complete without enjoying the delectable cuisine at the on-site eatery, Caroline’s Restaurant, which serves steak, seafood and pasta during dinner hours. November marks the beginning of Dubuque’s Winter Farmers’ Market, operating downtown from 9 a.m. to noon every Saturday morning throughout the season. Despite the dip in temperatures, local vendors shelter indoors to sell everything from fruits, vegetables, jams, baked goods, cheeses, meats and honey to lotions, oils, soaps, candles and other household items. “Even though summer has passed, there’s still plenty of fresh produce to delight in at the local farmers’ market,” Cummings says. A diverse selection of other attractions and activities awaits, such as the Dubuque Museum of Art, showcasing more than 2,000 works; Park Farm Winery, a chateau-style retailer with an 11-acre vineyard; and Dubuque River Rides, a steamboat excursion that cruises down the Mississippi River. Starved Rock Lodge kicks off fall with a special kegtapping that includes German music. A few weeks later, the celebration resumes with German beer, wine and music dinners. As summer draws to a close, the pace of life slows down, along with the number of times you have to mow the lawn. The minute a change of seasons is in the air, it’s time to start thinking about your next vacation getaway. Starved Rock State Park & Lodge, in Utica, Ill., offers great events with close-to-home-but-worlds-away appeal. There’s no better way to explore one of the most scenic places in Illinois than by hiking at Starved Rock State Park. Guided hikes, which travel about 4.3 miles round-trip, are offered each weekend and include lunch. If you’re up for hiking all the trails in one day, sign up for the MegaHike on Sept. 26 and 27. Hike-a-Palooza is a three-day marathon of hiking that covers three area parks and more. The Veranda of Starved Rock Lodge provides an amazing view and a variety of lunch and dinner options from an outdoor grill. Live music adds to the fun Friday and Saturday night (starting at 8 p.m.) on select dates this fall. Autumn puts fall-themed fun “on tap” at the historic 1930s-era Lodge with a kegtapping on Sept. 27 that includes German music by the Doodledorfers Band. A great menu of German beer, wine and music is featured at two upcoming Oktoberfest Dinners slated for Oct. 10 and 11 (during Burgoo Festival Weekend) and Oct. 17 and 18 (during Fall Colors Weekend). Fall Colors Trolley Tours are offered on Mondays and Saturdays so that leaf lovers can get their fill of fall foliage before the colorful array disappears. Land & Water Cruises on the Belle of the Rock offer a riverboat adventure mixed with a history tour of the area. Storytelling is performed by a campfire every Saturday in October at 7 p.m., just steps away from the main lodge, at the Fox Ridge programming stage. Musical tribute shows bring renditions of The Legacy Girls (a 1950s show) on Sept. 28 and Patsy Cline on Oct. 5 and 6. Whatever time of year you visit, you’ll be greeted with a warm welcome and reminded that Starved Rock Lodge truly is a place where the past is always present. For tickets to special events, call (815) 220-7386. See more events online at starvedrocklodge.com. 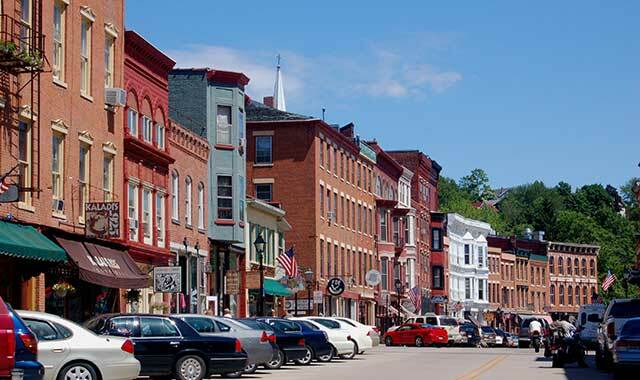 Galena’s Main Street is a central gathering place for many local festivities. Few places in northern Illinois can rival the fall scenery that’s a natural part of Galena’s charm. Nestled in the Driftless Area of northwest Illinois, this city is built right into the rolling hills. Fall is a prime season for Galena, as its events calendar shows: Nearly every weekend from mid-September through November is packed with festivals and seasonal attractions. The season kicked off Sept. 11 with the annual Ladies Getaway weekend, where many resorts, bed-and-breakfasts, and shopping destinations cater especially to women with events, contests and shopping deals. Galena welcomes October with the ninth annual Oktoberfest, this year on Oct. 3. 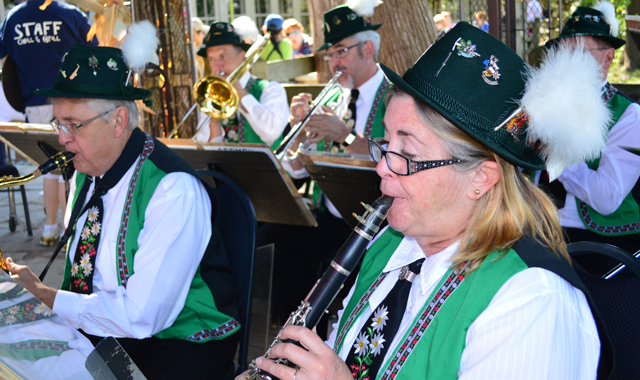 The celebration brings a day of German foods and beers, kids activities and polka aplenty. On Oct. 10, Galena spotlights its artistic side with a weekend of arts and crafts fairs. The Galena Country Fair draws more than 150 vendors of original handmade arts and crafts. The following weekend, the 20 Dirty Hands Pottery Tour draws art enthusiasts to a self-guided tour of area pottery and sculpture studios in Galena and beyond. Many of these locations open to the public just a few times each year. This is also an ideal time to tour some of the area’s beautifully preserved homes. In fact, a good portion of the city has been listed on the National Register of Historic Places. Outdoor activities slow down by November, but the weather isn’t enough to stop oenophiles from visiting during the annual Nouveau Weekend, this year from Nov. 20 to 21. Galena Cellars Vineyard & Winery’s celebration of the new harvest begins with a French-inspired tradition parading the fall’s first new vintage down Main Street. While you’re in town, be sure to capture some of the fall color amidst Galena’s bluffs. One of the most spectacular views, says Ruffini, is at Horseshoe Mound, a public park just outside of town that looks down on Galena. Fall is, in many ways, a sort of homecoming for this charming community and its neighbors. For more information, go to galena.org. Lena, Ill., is a classic Midwestern small town with unique shopping destinations and a charming downtown. 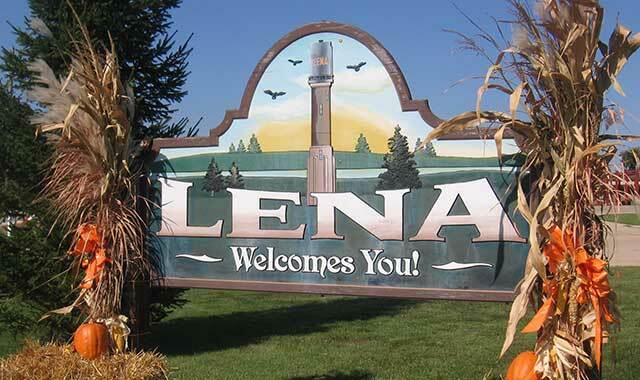 If you’re looking for an unforgettable day, look no further than Lena, Ill. This gem of a village is tucked between the rolling hills and prairie flatlands of northwest Illinois, with a plethora of fun activities to experience. The village’s crown jewel is the Lena Brewing Company, which hosts guided tours every Friday, Saturday and Sunday. Visitors receive three beer samples and a souvenir pint glass with their tour, which wraps up in the brewery’s taproom. Terhune highly recommends a visit to Lena Mercantile, a literal treasure trove where more than 40 vendors sell an eclectic mix of goods, from antiques, collectibles and custom woodcrafts to candles and even a wide array of chocolates. Located on the corner of Illinois Route 73 and West Railroad St. in downtown Lena, the store is open daily from 9:30 a.m. to 5:30 p.m.
An eatery located inside serves soups, salads and sandwiches Monday through Saturday, from 11 a.m. to 2 p.m. Enjoy the sandwich of the day or a regular menu item before indulging in homemade pie, cheesecake and other desserts. There’s also fresh-roasted coffee. Other must-see stops include the village’s 109-year-old water tower – a steel tank set atop limestone blocks and red bricks that rises 100 feet high. Take a drive down the Stagecoach Trail, also known as West Galena Road, and cruise on some of the highest terrain in Illinois. Ample opportunities for camping are nearby at Lena KOA Campground, located one mile south of downtown, and Lake Le-Aqua-Na State Park – only a couple of miles north. Golf courses tailored to all skill sets are found throughout the area. Before you depart, be sure to check out the award-winning AJ’s Lena Maid Meats. The butchery is nationally known for its beef sticks, jerky and other high-quality products – all of which come from locally raised livestock. Whether you’re a traveler or a local, an assortment of indoor fun and outdoor beauty are waiting for you in Rockford. Autumn is an especially busy time for the region. 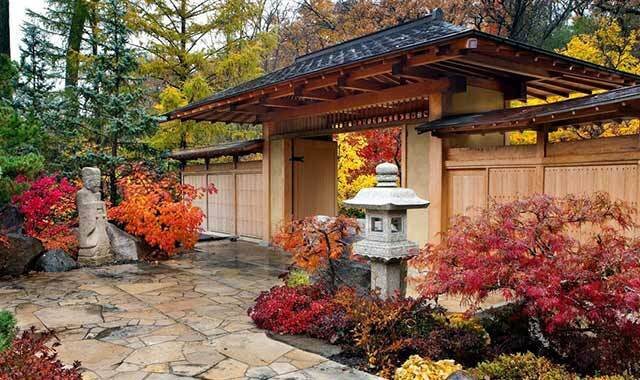 A few ideal places to experience fall beauty are Rock Cut State Park, located on Illinois Route 173, Klehm Arboretum & Botanic Gardens, on South Main Street, and Anderson Japanese Gardens, on Spring Creek Road. The natural landscapes at all three locations come alive with autumn color, and each has walking paths that are perfect for exercise or leisurely strolls. The crisp autumn air means the area’s apple orchards are in full harvest, too. Edwards Apple Orchard West carries 18 varieties of locally grown apples, apple cider donuts, freshly made cider and other treats such as raspberries and pumpkins. There’s also a children’s play area. Meanwhile, at Curran’s Apple Orchard, families can find fresh-baked apple pie, ginormous caramel apples, award-winning cider and other excellent eats. Enjoy riding on the hay wagon, climbing on straw bales, exploring mini-mazes and experiencing many other recreational activities while you’re there. Off the farm and in the city, the Rockford region boasts a wide range of culinary delights, hailing from many cultural backgrounds. “We have a number of delicious locally owned eateries,” Mandala says. A few of her favorites are GreenFire Restaurant Bar & Bakery, PK Diner (serving breakfast and lunch only), Social Urban Bar & Restaurant, Abreo, Alchemy at Giovanni’s Restaurant & Convention Center, Octane InterLounge, Prairie Street Brewhouse and Fresco at the Gardens. “These places offer locally sourced foods and outstanding farm-to-fork seasonal options,” she adds. Many of these eateries are located in and around downtown Rockford, where visitors will find a growing presence of weekend gatherings, small businesses and creative artists. The entertainment carries inside as the weather cools down, with exciting performances coming soon to the glamorous Coronado Performing Arts Center downtown. Music sensation Jackson Browne performs on Nov. 13, and Rockford’s very own Cheap Trick returns to its hometown on Nov. 21. “From big headliners to local artisans and makers in our region, people can enjoy the captivating and authentic talent and creativity offered in Rockford,” Mandala says. This entry was posted on Friday, September 25th, 2015 at 12:00 pm	and is filed under Recreation & Destinations, Top Posts. You can follow any responses to this entry through the RSS 2.0 feed. Both comments and pings are currently closed.